PuzzleMad: A Burrtastic (but painful) Week! A Wish Come True! A Burrtastic (but painful) Week! A Wish Come True! 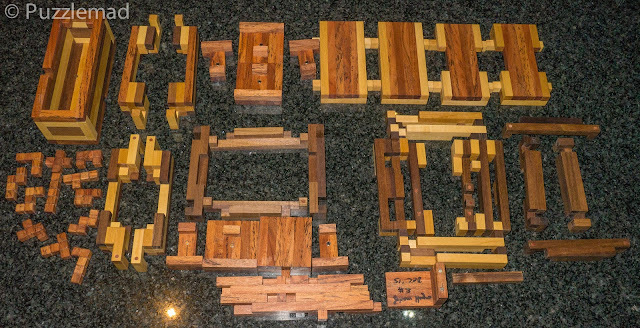 Last week's blog post was all about metal puzzles - I did manage a short abstinent period but I'm very easily swayed and it only takes a little push to have me back playing with my wood! In the middle of January I received a couple of new puzzles from Jakub Dvořák of the New Pelikan Workshop and a few days later they were made generally available for you all to buy. This gorgeous looking burr has kept me occupied for a couple of weeks and I finally managed to solve it last Friday. This one is called Mimicry and is designed by the incredible Christoph Lohe whose designs always seem to add something new and fun to explore. 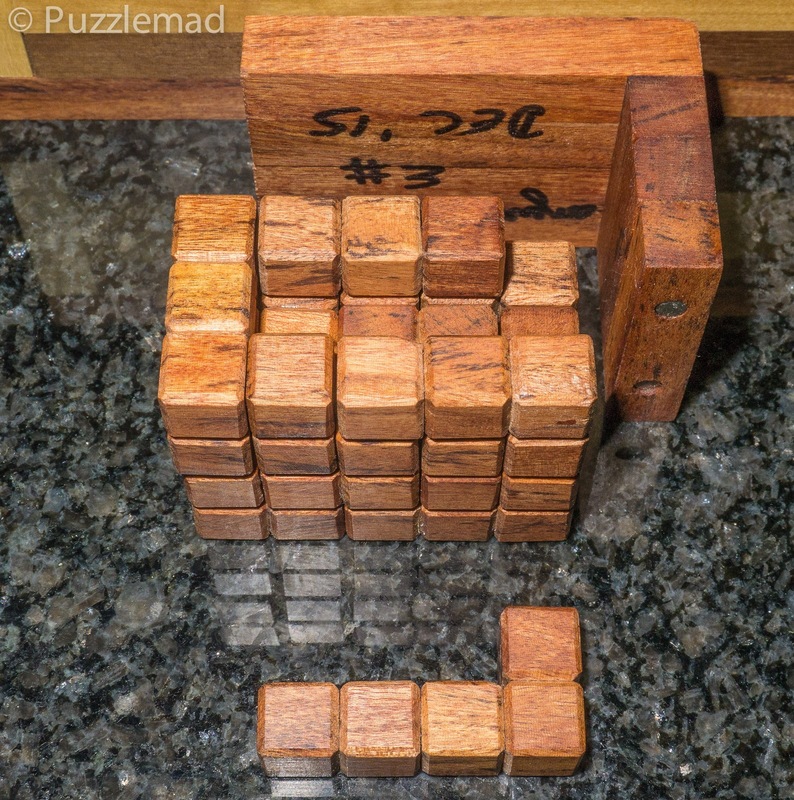 This puzzle is not yet on Puzzlewillbeplayed so there was no chance for me to cheat by looking up the pieces and entering them into Burrtools. "This design exists of six 2x2 sticks of length 6 in an unusual 6x6x6 frame which I think has never been used before. The frame consists of twelve 4x1 rods which are connected by eight internal corner voxels. 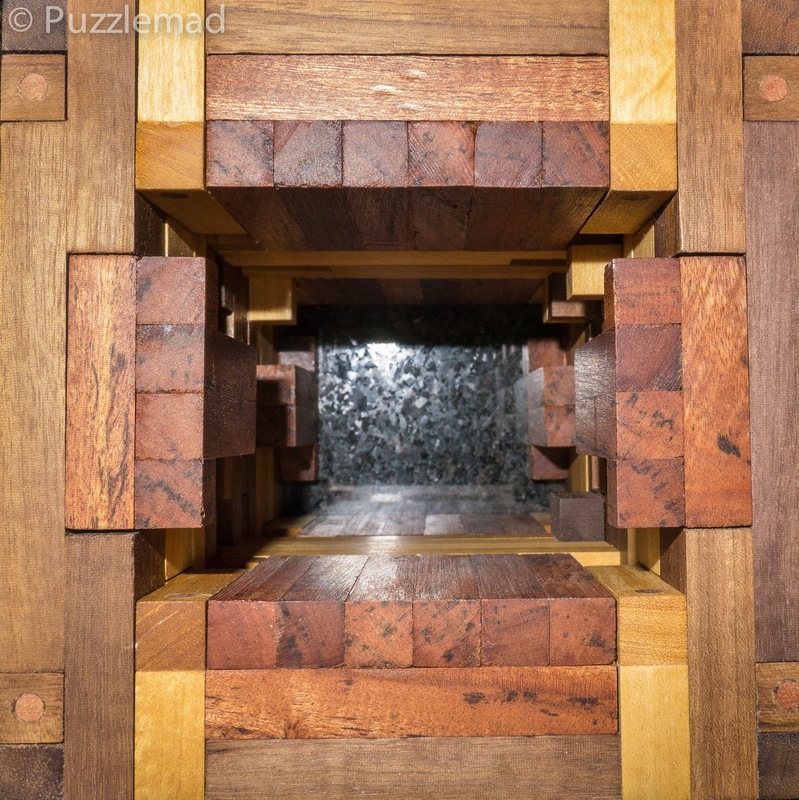 Because of these internal corners, the puzzle is densely packed. 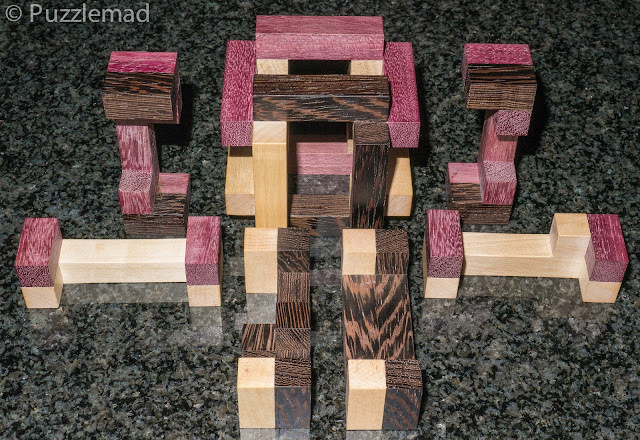 The sticks are bicolored and the frame is tricolored to result in a unique 27.18 solution. Ignoring the colors there are more than thousand solutions, starting from level 1. The name 'Mimicry' was selected as the outer appearance looks like six 2x4 sticks of length 6." Of course when I was offered the chance to buy it, I couldn't resist! I love my burrs but really like a level that is challenging and fun. As my friend Jose Dias says; "any puzzle with too high a level ceases to be fun and becomes work", I can honestly say that whilst level 27 sounds very high, it is actually a perfectly solvable puzzle by anyone with a little bit of burr experience. There is a little bit of work because there are quite a lot of blind ends in the solution path, but they are not so long that you risk getting lost. The correct path is long and winding and has a few tricky moves but never enough to dishearten you. Having said that, I have to admit that it caused me a little bit of pain! Initially the pain was a mental torture, finding my way through the maze of moves and then getting lost at one point going back and forth to the beginning because I just could not find a crucial move. After 4 days of back and forth I was just a bit too vigorous pushing one of the sticks when it was not aligned properly and there was one of those sickening cracks and an endplate fell off. Aaaaargh!!! 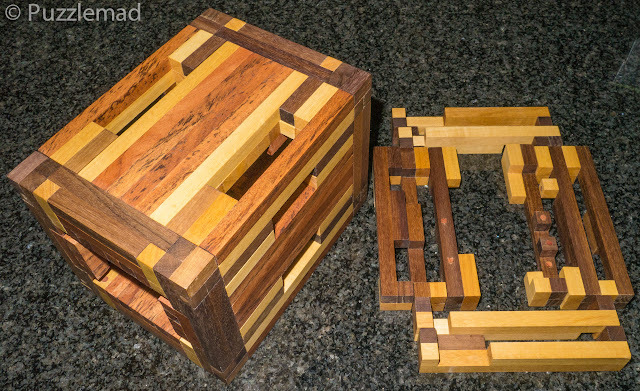 Luckily everything in the puzzle stayed aligned and I quickly took out my trusty wood glue and clamps and repaired the break. I was very proud of myself the following day when I removed the clamps and saw that everything was so perfectly aligned that it was impossible to see the repair. Unfortunately more pain ensued a minute later as I realised that I had glued the stick to the frame......rather tightly!! Aaaaargh again!!! At this point with an edge of panic I pushed and pushed and PUSHED in the appropriate direction and Crack! Ouch! No I hadn't broken it again but the aberrant join came apart and it moved vigorously forwards taking a rather large chunk out of my thumb! It's amazing how much blood comes out of the pulp of a thumb! It would not stop bleeding despite pressure for over ½ an hour - I was starting to panic - not about blood loss (I see that every day at work - we had a 7L blood loss 2 weeks ago) but heaven help me if I spilled blood on the carpet. Mrs S would give me far more than a Whack! Ouch! if I ruined a carpet! You would not even find my body! After that experience I put it away for the rest of the day. The rest of my week at work continued to be painful. All healthcare professionals (yes I AM a professional!) have to use alcoholic handwash many many times a day. Let's just say that I yelped with pain many times over the next few days. In fact after a couple of days I cut the thumb off a nitryl glove and kept it on my thumb the whole time. Phew what a relief that was. On Friday I had a breakthrough moment after finishing my week with a rather good Edinburgh raspberry gin and tonic (Cheers Steve!!! ), I suddenly found the required final sequences to remove the first and second pieces. After removing 2 it was trivial to remove the others and reveal a very complex frame and 6 unexpectedly simple burr sticks. 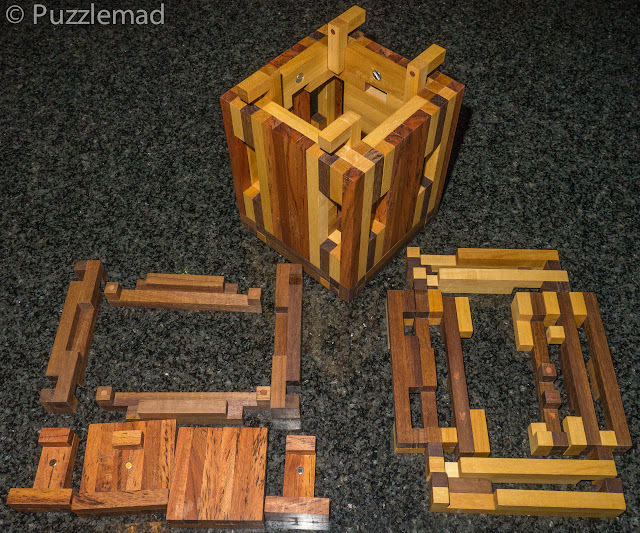 Having spent so long working on this puzzle, I was even able to reassemble it from memory with only a small struggle. It is such a wonderful sequence that I have been playing with it ever since - I love it; it's one of the most fun burrs I have tried in a while. I created the Burrtools file for my collection (as well as to send a copy to Derek who has a massive BT file collection) and was fascinated to see that there were 1089 solutions but using that particular colour set Christoph had enforced the highest level as a unique solution. Brilliant! These are in stock now at Pelikan puzzles here - get one whilst you can. You will not be disappointed in the quality or the puzzling experience. At the same time as I received the Mimicry, I also got my hands on a Mochalov ball. 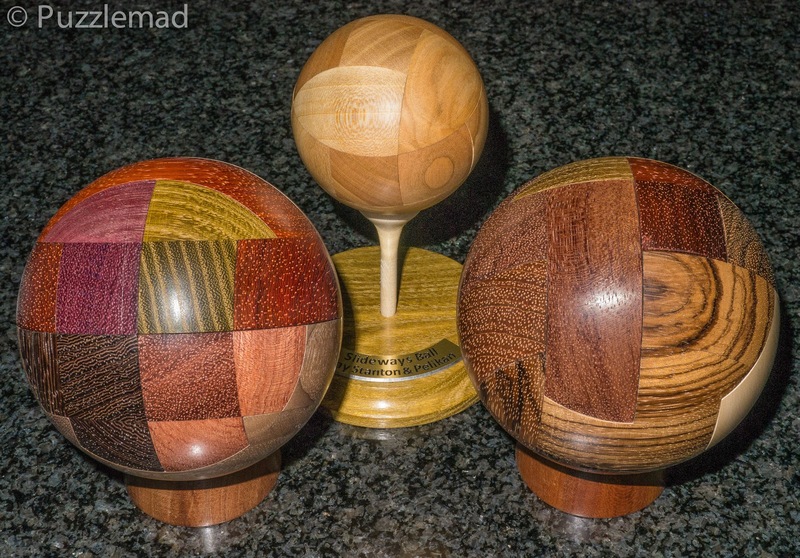 The Russian designer Leonid Mochalov designed an 8 piece cube puzzle many years ago and the boys at Pelikan did their amazing work on it and transformed it into a sphere. They did this initially a few years ago and it was sold by Bernhard and now they have repeated it and it is for sale on their site. 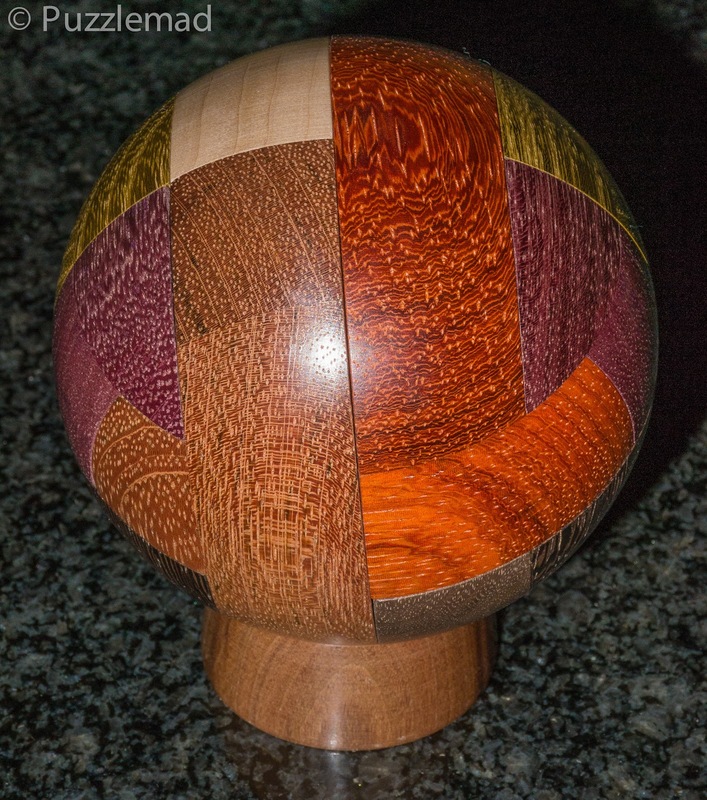 The diameter of the ball is 90mm and it is stunning in Purpleheart, Wenge, Maple, Padouk, American Walnut, Acacia, Bubingo and Jatoba. I start to drool just thinking about those gorgeous woods! It even comes with a beautifully turned stand so it can be displayed without fear of it rolling away. The challenge here is to find the first piece to be removed. After that the disassembly is fairly straightforward. 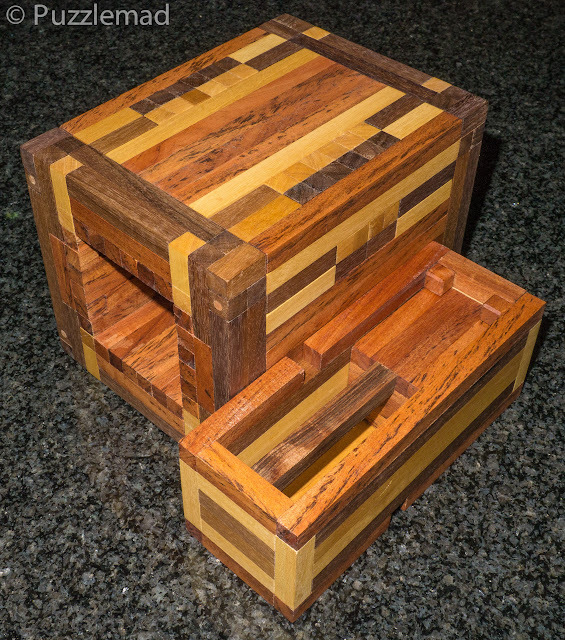 It is a sheer delight to see how perfectly each piece fits together. Just look at the perfection! It is so beautiful that Mrs S has allowed it to sit on display in the living room next to the companion Convolution ball - both have equally beautiful stands to stop them rolling away. All three of these balls are available from Pelikan just now but be quick as they sell out very quickly. I have shown off a few puzzles by Johan Heyns over the last few months and a few weeks ago I couldn't resist showing you something that I bought from him and which I watched in amazement as he worked on it and posted pictures on Facebook as he went. This epic tour de force is the Wish Cube. Johan had more or less given up making puzzles (his gallery of old productions is astounding) but early last year he resigned from his job and needed another way to earn a living. I was delighted when he decided that he would go back to making puzzles to earn some cash whilst he searched for something else. The Wish Cube was originally intended to be one of the puzzle boxes that went into the incredible Apothecary chest made by Rob Yarger and 12 other craftsmen. Johan wasn't happy with the design and eventually withdrew from the collaboration. Whilst this was a real shame for Johan and the group who made it but in the end, it was a huge boon for me and 13 others. When Johan first showed me pictures of his original a year ago, I drooled over it and encouraged him to try and complete it so that collectors (specifically me!) could enjoy it. He was not sure that he could bring himself to complete it and really struggled with the final design. 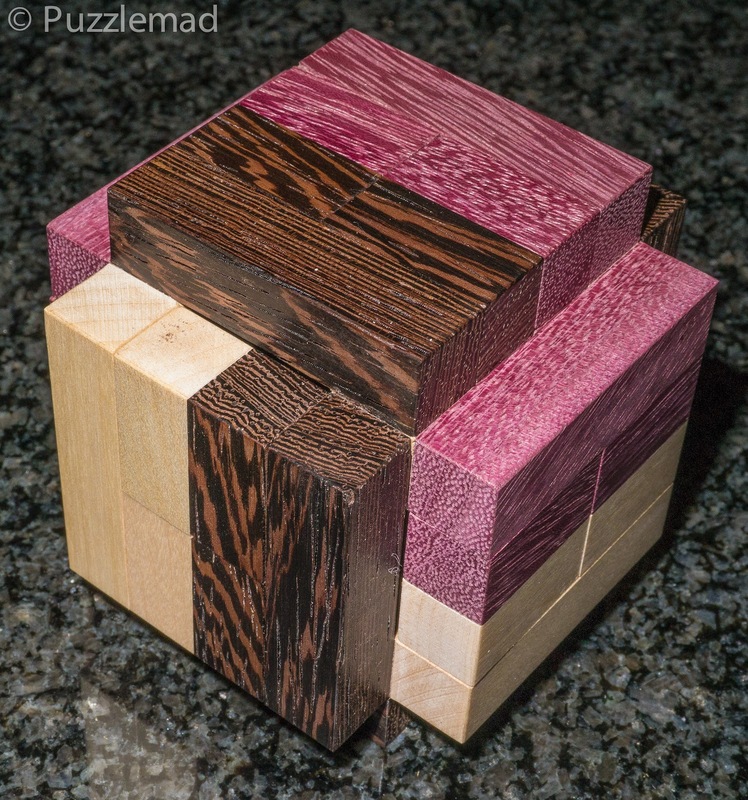 Eventually this summer I am very pleased that he collaborated with Jack Krijnen (he who made one of my gorgeous burrsets) and came up with a gorgeous cube with multiple facets to the solution. "it is 272 meters of wood to be cut up in 1x1x1 to 1x1x16 blocks. It is going to be a &#$&%$* massive job. " "20.46 meters of 10x10mm stock from which it is made makes it pretty heavy. 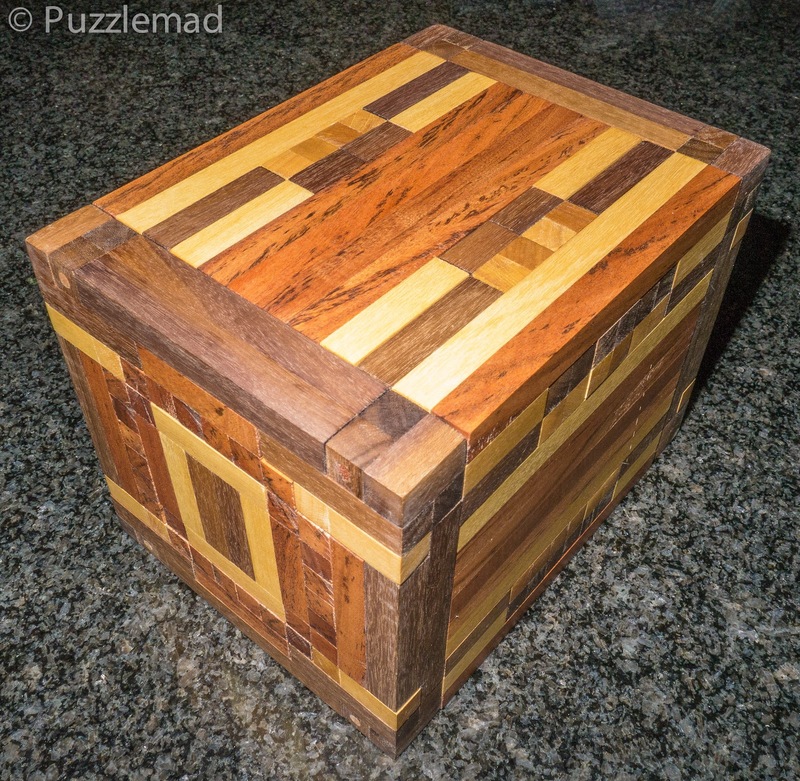 455 blocks glued together to make the 52 puzzle pieces"
No wonder it took months to make! We chatted a lot during the manufacture and he was great at keeping my spirits up when my Mum was dying - he sent me funny (and rude) jokes and was a really good friend. I was so proud when it arrived that I couldn't resist posting pictures here and on Facebook. I have been working on this puzzle for 2 weeks since it arrived and must say that it will certainly be in my puzzles of the year for 2016 - It is stupendous!!! 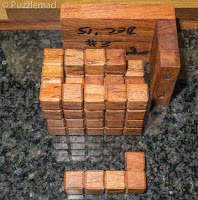 The Pentominoes in the tray are in a 3x4x5 cuboid configuration and when I took the cover off I was not careful enough! They all fell straight out on the kitchen granite! Aaaargh! Apparently there are 3940 ways to assemble this shape but Johan did warn that due to microscopic variations in the cubes, the tray packing only works in one way! Of course I had lost the original configuration when they fell out - only 2 were left in place. I spent a happy then rather frustrated 4 or 5 hours desperately trying to get the damned things back in the tray! This was not helped by the fact that I was doing it over several evenings with a cat on my lap who kept pawing at the pieces and even ran off with one of them! Eventually, with some considerable relief, I got them back inside and took notes for the future! Johan also provided a sheet with quite a few other pentomino problems to be tried - I am saving them for the future. It's easier without a cat! This took me a week or so! There are some VERY interesting and unusual moves in this burr. Even though you can see every part it is still a huge challenge to remove these burr pieces. Unfortunately, I have got them all mixed up now and will need Burrtools to reassemble it. I have managed the reassembly as far as the replacing the burr pieces but I will need to resort to Burrtools for the position of those pieces. Once I know where they go, I will be able to put it all back together and the wish cube can go on display. Mrs S said as soon as she saw it that it was too beautiful to be left on a shelf in my study. It is very large so will be proudly displayed next to Johan's other puzzles in my dining room. Thank you Johan! I really look forward to future productions from you. The quality of the puzzling and the workmanship is amongst the best in the world! I am very proud to be one of the 12 who can own one of these. I will take it to the MPP next week. OMG! That is a rather epic blog post! I hope you enjoyed my efforts. 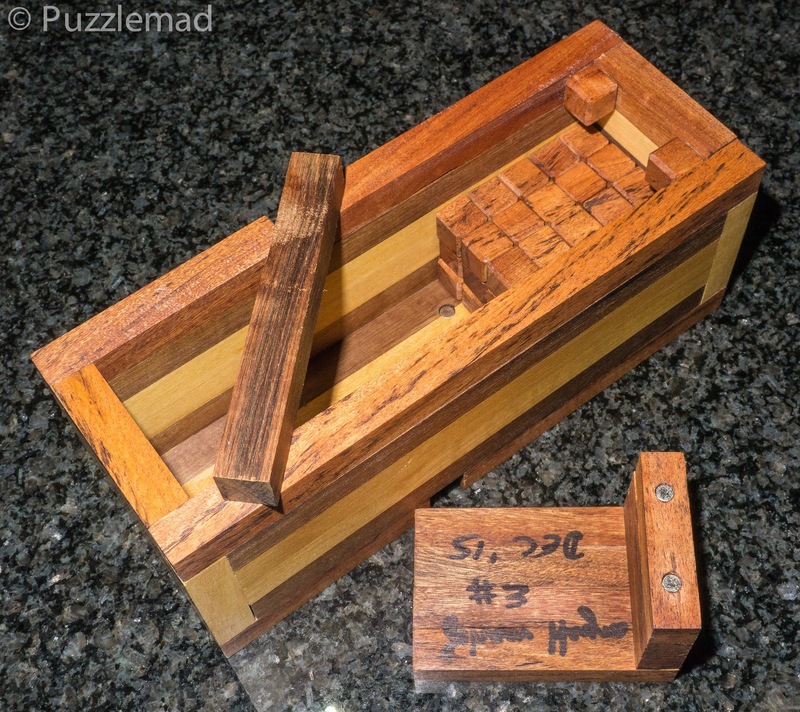 I have tried to ensure that there are puzzles reviewed that you can buy for yourselves as well as the very limited edition one that is no longer available. The Pelikan workshop are producing some of the best puzzles in the world just now! It's well worth having a look at their catalogue. I was thinking more of Johan's work, but it's all good! Hopefully you will get to see one at a puzzle party sometime! I meant every word! The Wish cube is an epic puzzle and worth every penny! Thanks for a fantastic puzzling experience and adding something gorgeous to my collection. Incredible puzzles Kevin, thanks for a great blog post. I'm glad you enjoyed it. These posts take many hours of puzzling, photograph taking and editing followed by writing! I try to make them humorous as well as informative and am delighted to hear when people enjoy them. It's just practice Jerry! Keep at it! 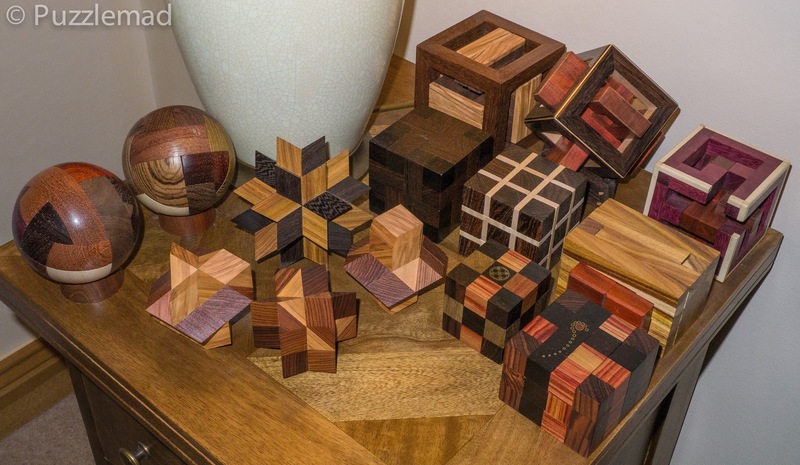 Amazing puzzles! I have a few comments, Kevin. First, I really like how easy it is for you to discuss playing with your wood. So many people are really embarrassed to admit that. Second, you need to squeeze the sides of your fingertips (thumb in this case) when you get a cut, the vessels run along the sides. Otherwise it keeps bleeding - I guess you know that. Now on to the good stuff - excellent sounding G+T really set the mood well, followed by your usual great descriptions of the puzzles. I'm amazed and impressed at how you completely disassembled the entire Wish cube. I know someone who hasn't even figured out the very first move yet. Ahem. You'll have to excuse me, I need to see about a G+T. Get to it Steve! 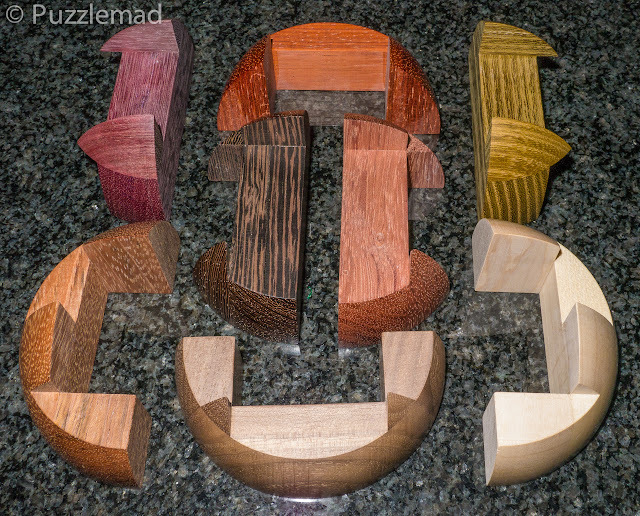 There's no harm in playing with your wood! You will love it. You should at least manage to get the tray out fairly quickly.